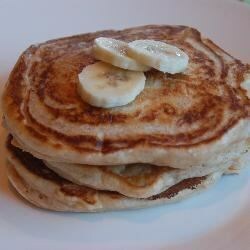 "These yummy pancakes are a snap to make." Great recipe - easy and low-fat, but tastes luscious. Even my DH (not a whole-wheat kind of guy) loved them. Add frozen blueberries for added taste. We did not care for this recipe. We felt that the pancakes were too dense and heavy, while we prefer light and fluffy pancakes. We will not be using this recipe again.